Just simply showing up to a trade show is not going to be enough to get favorable results from your exhibiting efforts. It takes months of planning, promotions, and having a well-designed portable or custom display to get the most out of these events. All good trade show plans start with a goal. A specific goal will make it easy to measure your results at the end of the event. As important as it is to have a goal, many exhibitors fail to take the time to define their objective for show participation. If you need a little help in determining what your trade show goal should be, following are some helpful tips. Determine your main reason for show participation and define your goal from there. Try to make your goal quantitative – numbers based – so you can measure your results once the show concludes. For example, what is the number of leads you want to collect for post-show follow-up. How many investors do you want to speak with about your company and products. 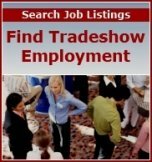 Once you have established your goal, now it is time to find the right trade show that will help you reach it. So, if want to get a specific number of leads, you’ll want to go to an event where your target demographic will attend. However, if your main priority is networking, find a trade show where there will be people from other industry-related businesses attending. Prior to the trade show, target your promotional efforts to the audience you are trying to reach. Every demographic will respond differently to promotions, so choose the message you want to convey throughout your trade show display very carefully in order to make a connection with either new or current customers, as well as other professionals. Creating a specific budget will keep you from spending beyond your means, hurting your return on investment. Allocate some of the budget for lead generation, promotions, travel, hotels, and anything else you will need for the event. Keep in mind that your booth will take up over half of your budget. Whatever your reason for participating in trade shows, have a specific goal in mind by following these tips for a successful event.